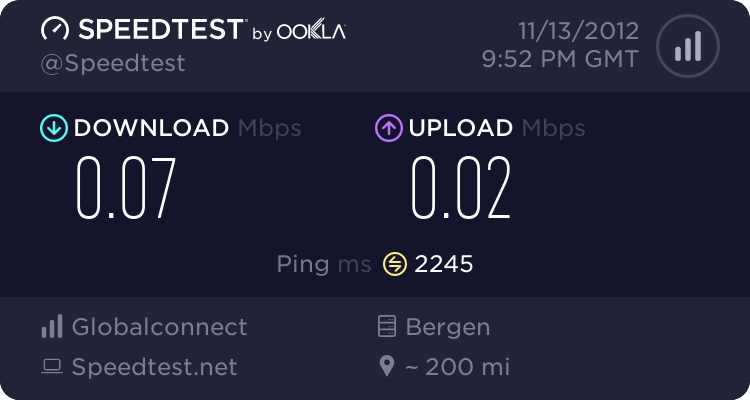 is this the worst connection in Norway or what? 2245 ping!!!! Omg grade F lol.. If this is not the worst.. Am scared to see what is lol.. Damn bro you need a new provider.. Are there no other companies? Where I live is quite far from servers.. There is limit of 75GB with speed of 4MBPS after that it degrades to 256 Kbps until next billing cycle.